I actually wrote about this in February and had used the moisturiser for a good week but even though I enjoyed it, I didn’t really rate it as anything overly special. How wrong I was. A few weeks ago I moved house and all my cosmetics were packed away in various boxes, with my usual regime being buried away somewhere, not to be found. 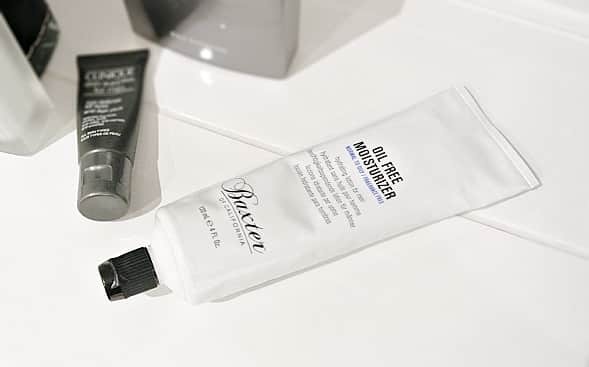 When I actually decided to shower after finally completing the move, the only moisturiser I could find that was vaguely appropriate was this Oil Free Moisturiser by Baxter of California. There’s no big claims with this product and no over-promising of any size, it’s simple, in simple packaging with simple ingredients. It has a gel-cream formulation, but as the name says, it’s completely oil free. There’s absolutely no added fragrance of any kind and it’s natural smell is light and sweet, almost yoghurty. It contains aloe, tea oil and chamomile which all help to hydrate and soothe the skin. When applying, it initially feels really greasy as you massage it in which immediately makes you think – “Uh-Oh!” Within a matter of seconds it sinks straight in and your skin is amazingly hydrated, soothed but completely matte. It really keeps me moisturised and hydrated all day and my flare up of spots that I had during the move have completely disappeared. People have actually commented how radiant my skin looks and the only things that’s different is this! This has become a permanent addition in my regime, I absolutely love it and it’s so great when you fall in love with something you’ve had in your cupboard all along! I will note that it doesn’t have daily SPF but I’ve just added a little REN Photoactive Sun Veil over the top for added protection. This article first appeared on MANFACE written by Thom Watson. It was published on Friday 6th July 2012 and was last updated on Monday 3rd April 2017 at 4:18pm. It's categorised under Baxter, Moisturise, Sun Protect where you'll find more related content.